That’s according to Robin Wiener, president of the Institute of Scrap Recycling Industries (ISRI). Resource Recycling sat down to talk with Wiener and Bernie Lee, ISRI’s commodities research analyst, at the Plastics Recycling 2017 conference, held this March in New Orleans. Lee: IHS Markit has been doing a lot [of price analysis] in the polyolefins sector, and some of their forecasts are promising in terms of seeing an uptick. I think that the confusing part that has a lot of people kind of at odds with what’s going on is that there’s oftentimes a difference between price and volume. But there definitely is a change in global structure of the industry, as well. And there’s a shift in terms of where the end users are. I was looking at statistics earlier that indicated about 67 percent of plastics exported out of the U.S. go to China, but only two or three years ago it was well over 70 percent, close to 80 percent. It’s been a continual decline, and that’s going to continue. And then you see India – I was just in India for a week – and it’s fascinating to see the growth and the development of the industry there. While there’s definitely going to be opportunities there in the future, I would imagine we’ll see a similar turn as we do in China, that it’s a priority within India to grow the domestic collection systems. I was personally surprised to see just how quickly China was able to develop their collection systems. I thought it would take a few more years. But I would imagine India is going to be faster than we think, as well. So it’ll be a market for us, but for how long, we don’t know. But Vietnam has certainly increased significantly over the last couple of years, as well as other markets. A year ago October, we joined with OSHA (Occupational Safety & Health Administration) for an alliance program so we can leverage resources we each have to get information out. Because as much as we’ve invested in the safety program, how much we’ve penetrated the industry, I can’t tell you. But it’s certainly not to the level that we want see. We haven’t moved the needle – to use a cliche – as much as we would have liked to. The accident rates are still higher than we’d like to see. We needed to figure out a way to penetrate the industry more, and so we thought leveraging with OSHA we could do that as a mechanism for also getting the best practices out. 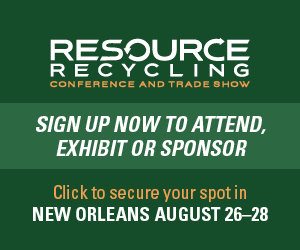 Jared Paben is the associate editor of Resource Recycling and can be reached at [email protected].